The Australian Christian Lobby is drumming up all the scare tactics and fear mongering they can manage to try and stop the amazing momentum we are gaining towards Marriage Equality in Australia, despite our bigoted Prime Minister still not being on board. The ACL are resorting to those tried and true claims that once we approve Marriage Equality then it’s only a tiny baby step from there before we are allowing Polyamorous marriage, marriage between pedophiles and children, marriage to animals, marriage between siblings and even furniture. Of course any logical argument against these fear tactics proves that we have an evil agenda apparently and that we are being unfair by opposing their religious beliefs. The Australian Christian Lobby have also accepted tens of thousands of dollars in donations from Gloria Jeans coffee. There is a bit of a call sweeping facebook to boycott Gloria Jeans in the wake of this donation, but to be honest no one I know drinks their coffee anyway because it takes bitter and spiteful just like the ACL and Gloria Jeans themselves. If God tasted their coffee he’d be ashamed of anyone associating his name with it. 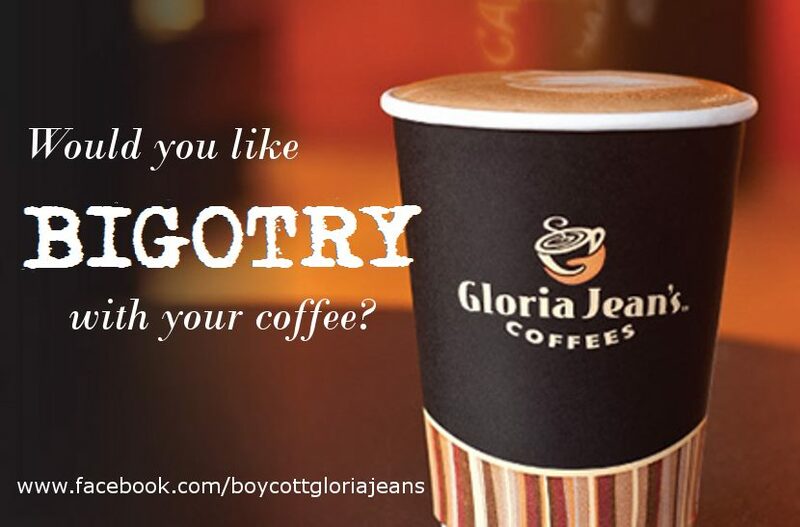 Feel free to contact Gloria Jeans and let them know what you think of their particular blend of bigotry. Gloria Jeans is owned by Hillsong Church, it shouldn’t come as a surprise that they’re backing ACL financially. I will never patronise Gloria Jeans again. Thanks for this info. your PM doesn’t like any kind of Queen, royal or gay. You have Gloria Jean’s and we have Chik Fil-A.